Hi there, this is Cheryl from Meadow Mist Designs and I am so excited to share my first project for Moda Bake Shop! 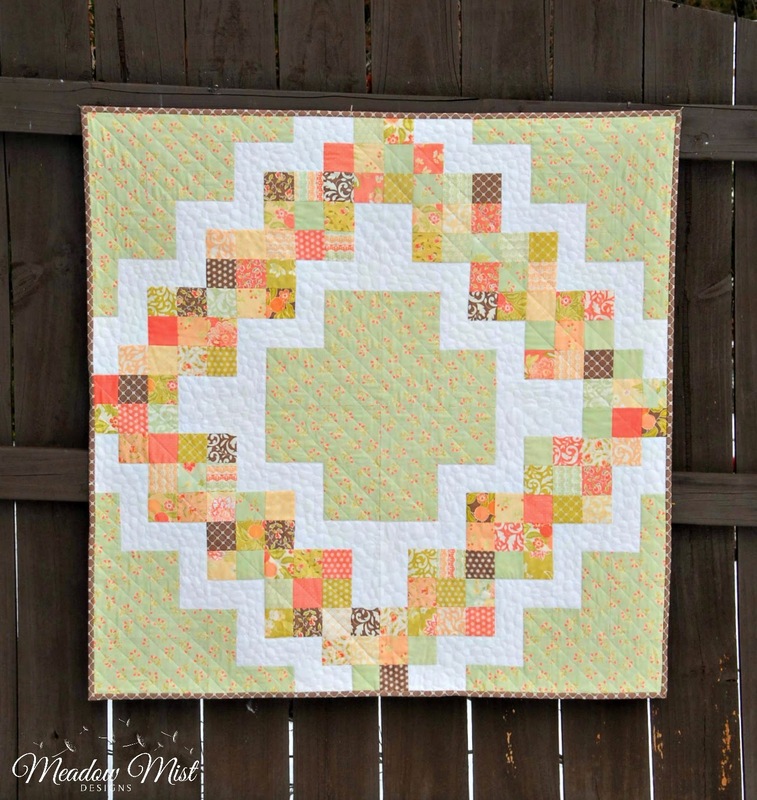 I love the cute Moda candy packs and all of Fig Tree & Co.’s fabric lines so I was thrilled to combine them to make the Candy Circle baby quilt. With just four mini charm packs (or just one charm pack), a focal print fabric, and some background fabric, you can have a cute baby quilt ready to gift. 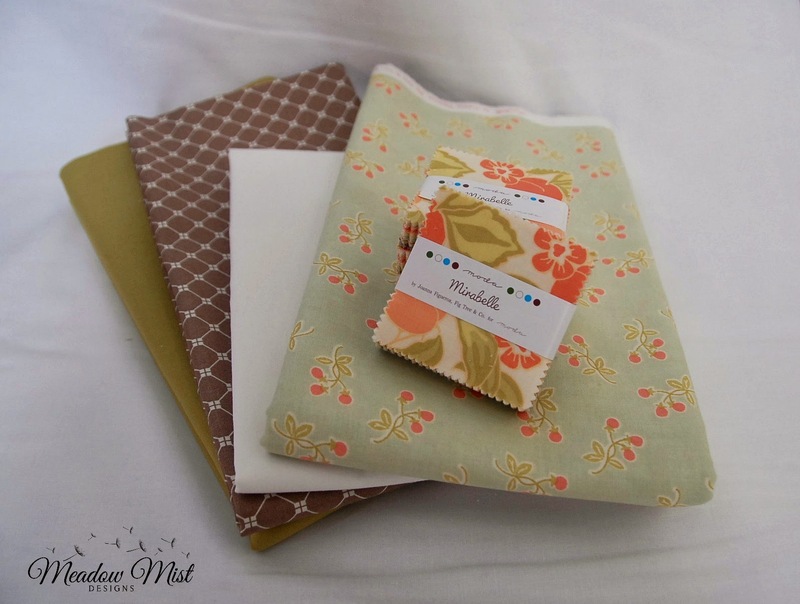 4 mini charm packs (also called candy packs) or 1 charm pack: Mirabelle by Fig Tree & Co.
*Note: if you cut each strip in each step you may have a few extra pieces cut. 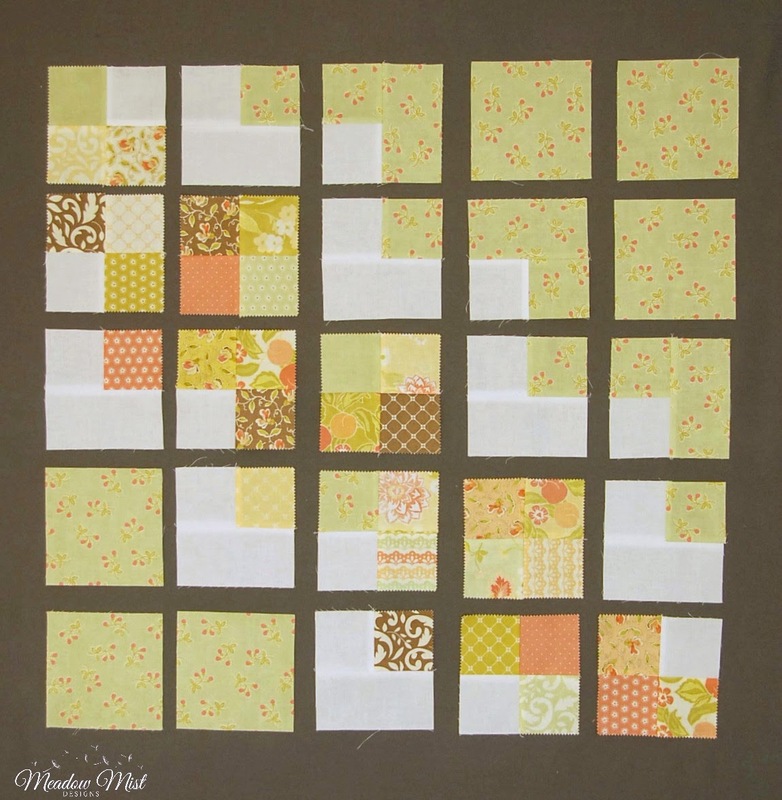 2) Select 132 of the 168 squares (2.5” x 2.5”) to use in the front of your quilt. Pick squares with good contrast with the background. 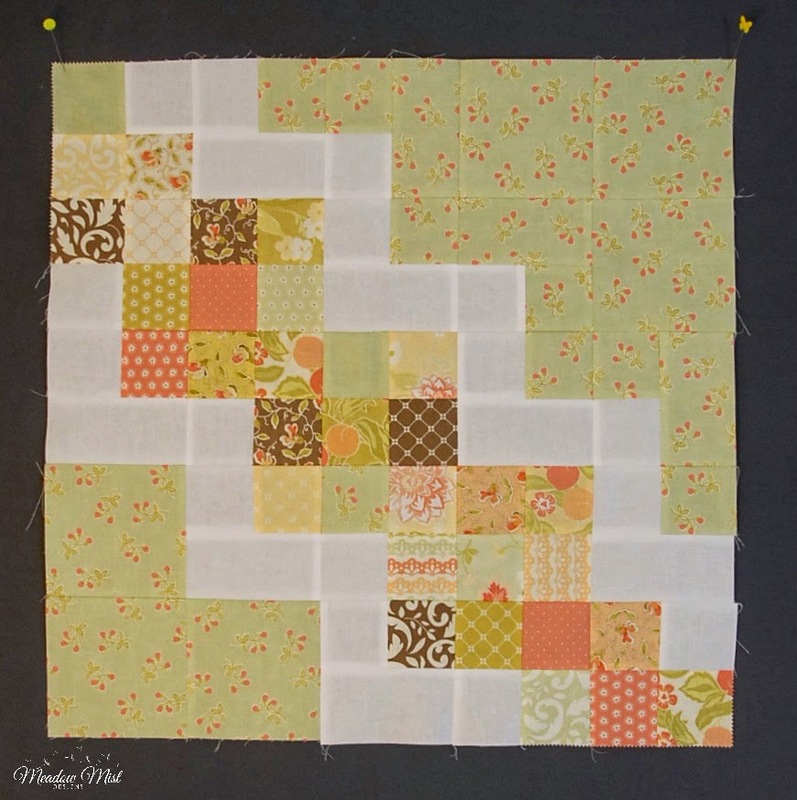 You can use the leftover squares for a pieced backing. 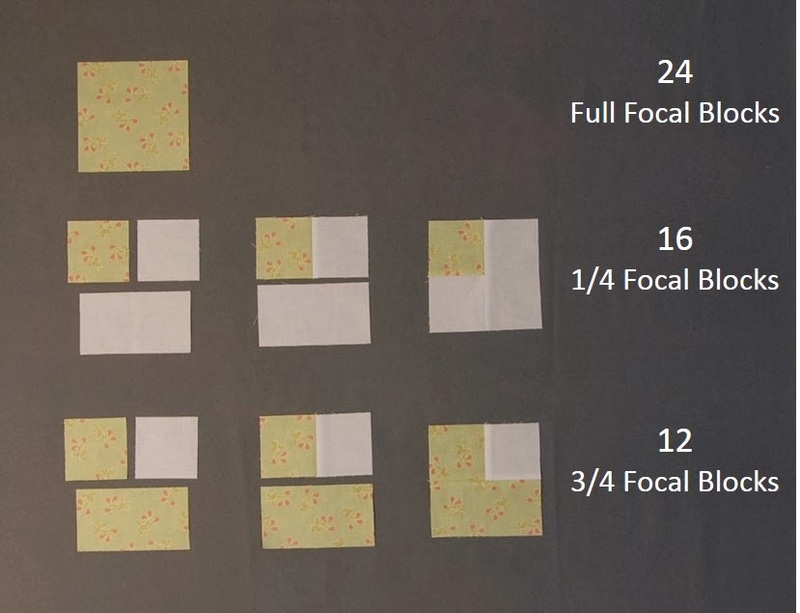 These 4.5” x 4.5” squares are the “full focal blocks”. 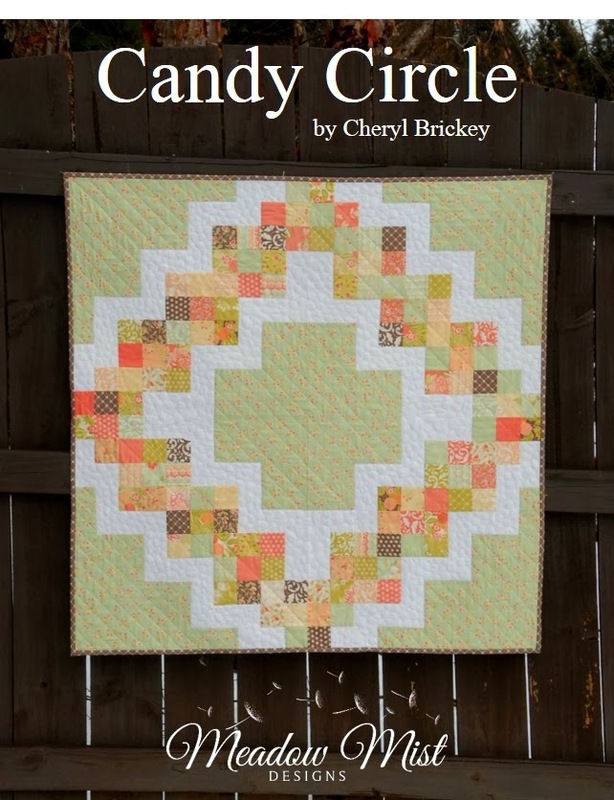 The Candy Circle quilt contains 6 types of blocks. Using the following amounts of fabric pieces and following the sewing pictures, sew pieces into rows and then rows together into blocks. Press all seams open. Sew blocks together into rows (pressing seams open) and then sew rows together pining at each intersecting seam (pressing seams open). Repeat 3 more times for a total of 4 quilt sections. 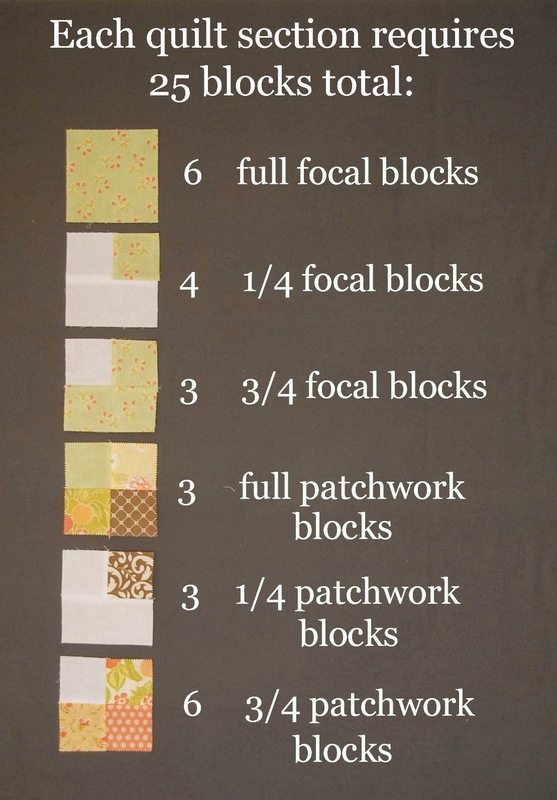 (Alternatively, you may layout the full 10 x 10 block arrangement for the whole quilt, sew the blocks into rows, then sew the rows together). 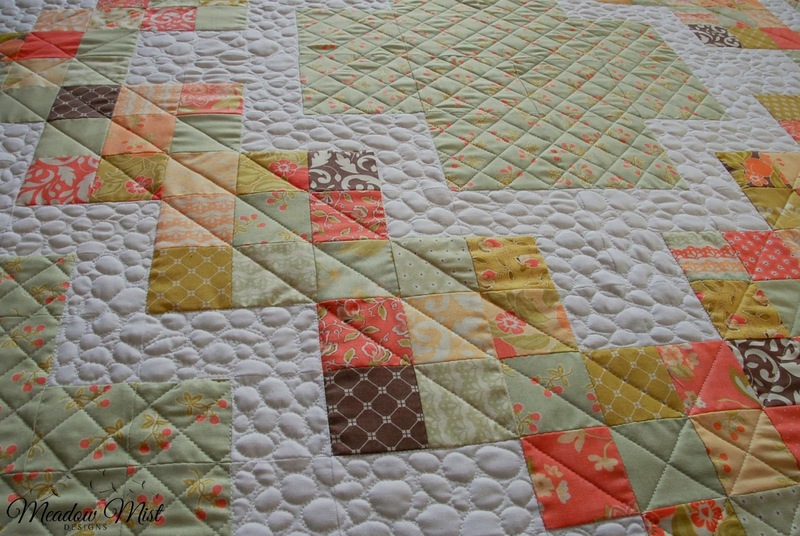 Sew the 4 quilt sections together (pressing seams open). 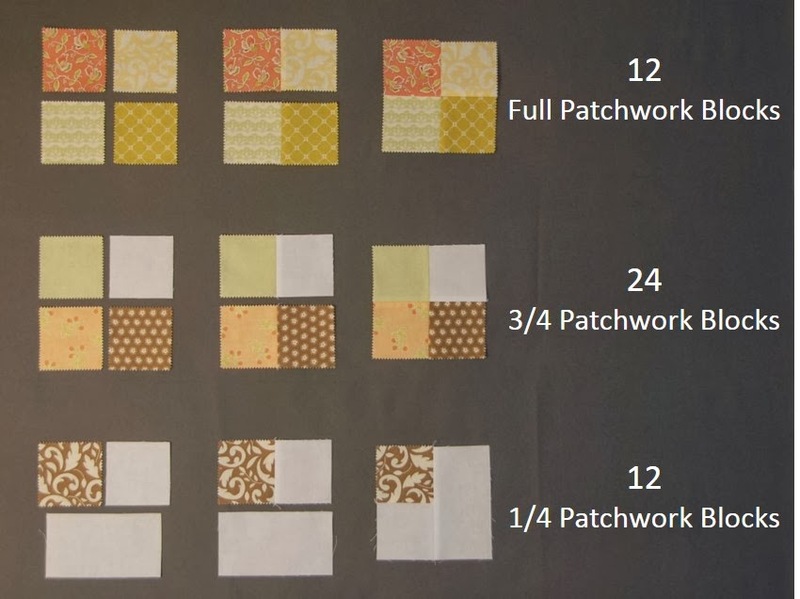 Sew the 22 patchwork squares into a row, then sew the 2.5″ x WOF background strips onto either side of the patchwork row. Slice the backing yardage (I made my cut about 2/3 of the way across the fabric) and sew the patchwork section into the background yardage. 1) Layer the quilt top, batting, and backing and baste the quilt. 2) Quilt as desired. I quilted the focal fabric areas in a straight line lattice, quilted the background areas using a small pebble design, and quilted the patchwork squares with straight line quilting. 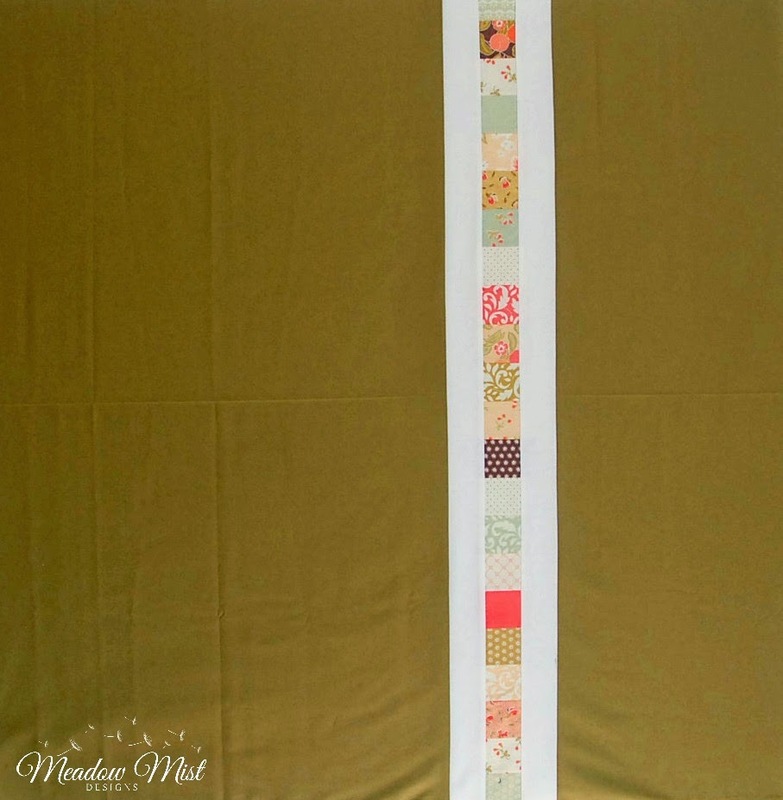 3) Bind the quilt using 5 strips 2.5” x WOF (for straight, not bias binding). More information on binding can be found here. Thank you so much for joining me in my first Moda Bake Shop tutorial. 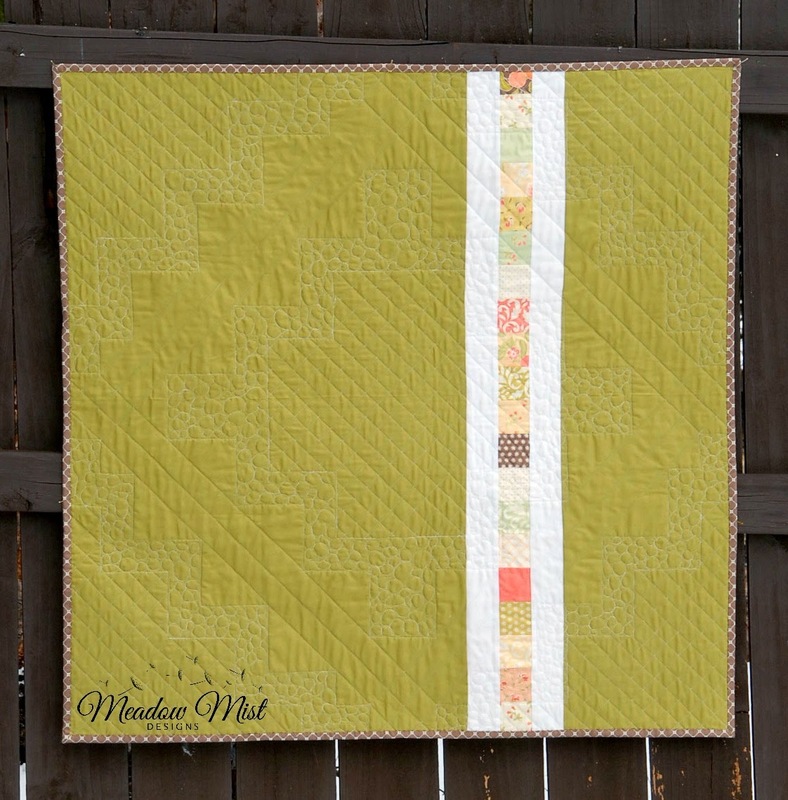 I would love to see what you make with the pattern, please add your quilts to the Moda Bake Shop flicker group and the Meadow Mist Designs flicker group. 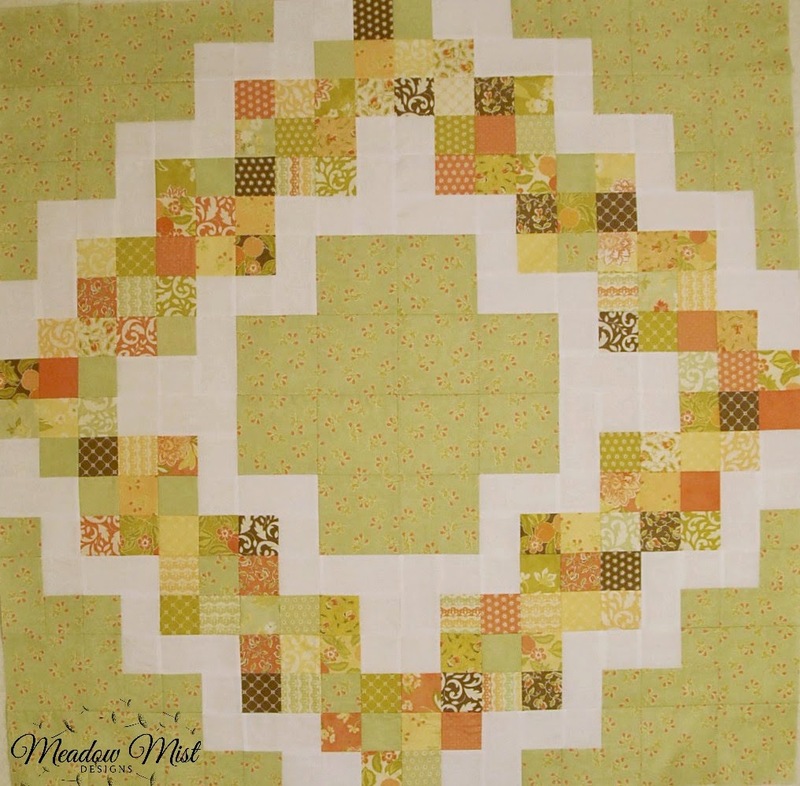 Visit this page on my blog (www.meadowmistdesigns.blogspot.com) to see the quilt pattern rendered in other colors including a holiday version. This entry was posted in Baby and Kids, Charm Pack, Easy, Moda Candy/Mini Charms/Petit Fours, Quilt and tagged Fig Tree and Co., Meadow Mist Designs, Mirabelle.